Rarely has my professional work intersected so nicely with my personal history than in the forthcoming publication of a new book by author Ervin Stutzman, Jacob’s Choice. The Jacob in this page turner of a book (to be released by Herald Press on Feb. 8) is my sixth-generation-back great-grandfather, along with how many other thousands of kin: Mennonite, Amish, or not. As Jacob’s early 1700s-era home was torched, he witnessed not only the agony of the death of his wife and two children, but he and two surviving sons were captured by members of the tribe of Lenapi Native Americans. One of the older sons who was not captured was John, my five times great-grandfather. He was already married and living away from the farm where the raid happened. 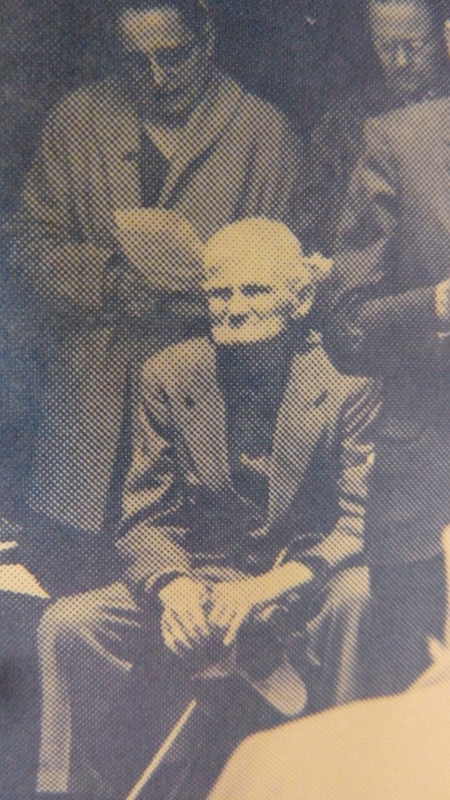 my great-grandfather, and Jacob’s triple great-grandson. The novel is set in the Northkill area of eastern Pennsylvania and, while carefully historically researched, is a fictionalized version of the events. So much is not known, especially the interior thought life of these ancestors. In Jacob’s Choice, Ervin has chosen to focus his look at this courageous, peaceloving ancestor on Jacob’s decision to eventually seek reconciliation in the aftermath of the terrible tragedy that befell his family. Here’s a link to two free excerpts. And this volume is just the first of three books in a planned trilogy called the “Return to Northkill” series. A lifelong churchman and currently executive director of Mennonite Church USA, developing the writing chops to turn out plausible and engaging fiction is no easy feat. Fiction coaches help, so say my inside (but not secret) sources. Cousin Ervin (okay, its really shirttail, as momma always used to say about distant cousins, but still) has done hundreds of hours of painstaking research. He became something of a skilled historian and researcher in pulling together the fictionalized stories published earlier by Herald Press of his own mother and father in Emma and Tobias). I greatly respect not only his work, but how he is able to get all this done on the side. The expanded edition of Jacob’s Choice includes maps, photographs, family tree charts, and other historical documents to help readers enter the story and era of the Hochstetler family. Both Jacob’s Choice (the novel only) and Expanded Edition (novel with all the other goodies) are on prepublication discount ($10.50 and $20.99, respectively) until the publication date of Feb. 8. If you are on Facebook and a relative (or just interested) you might enjoy hooking up with the “official” Facebook site for Hostetler/Hochstetler relatives, called Descendants of Jacob Hochstetler. There is a version of the genealogical book of the same name on Amazon, but I cannot vouch for its authenticity. There is also a complete PDF of the whole book available online. Yes. Here. All 1200+ pages! 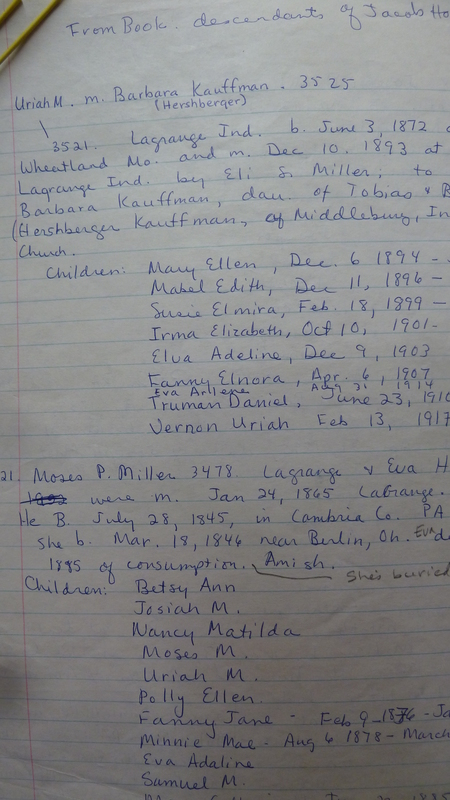 In the 70s, when I was a student at Eastern Mennonite University, I first discovered the genealogy book in the Historical Library there and was so excited to find my father’s name written in it that I scribbled out all of the information pertaining to my lineage on notebook paper (not being able to photocopy it). I still have those scribbles and I remember feeling such a powerful connection to my heritage. 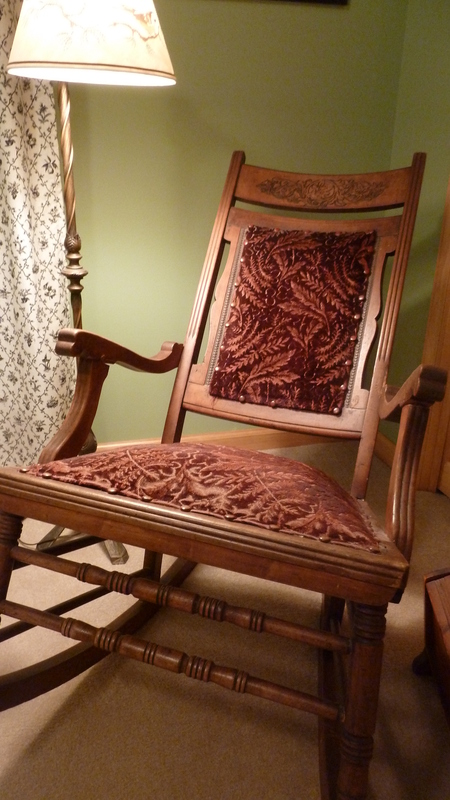 After writing about this for my own blog here, I sat on the floor for a morning workout and all of a sudden my eyes were drawn to my grandfather’s rocking chair. I could almost see him sitting there, elderly, as I knew and loved him. (Photo bottom left is my Grandpa Uriah seated circa 1962 at a CROP Farm dedication.) I had not felt his presence or even thought about him much for many years but how thankful I am for the long (92 years), loving and faithful heritage he bequeathed to our family. Are you part of the Hochstetler clan? We’d love to have you comment, share, like this on Facebook, join in the celebration. And if you are in the eastern Ohio area, join Ervin Stutzman & our editorial director Amy Gingerich for a book signing there from 9 a.m. to noon, Feb. 8, at Gospel Book Store, in Berlin! Or in Harrisonburg, Va., join us for a launch Feb. 14 at Park View Mennonite Church. And sign up to follow Mennobytes blog to always get information like this as it becomes available. regardless of any personal historical or family connections. Order before Feb. 8, 2014 for the discount. It’s early on a weekday morning and here I am working away with a pitch pipe in one hand and a hymnal in another. My desk is littered with music—hymnals and other songbooks (going back to the 1970s Sing and Rejoice), children’s albums, and even a few CDs. It’s time once again to choose Vacation Bible School music at MennoMedia. Have I mentioned before that I love my job? Yep, this is one of the seriously fun parts of it. Before I know it, it’s time to log into a Skype call and talk about the possibilities. We have a new marketing team member and when he learns that we’re going to actually sing in this call, he seems a bit concerned. Really?! I admit that I was initially a bit skeptical as well. While I love music, I do not consider myself to be a gifted musician or a singer. Yes, I took piano lessons as a child. The lessons taught me how to read music, but that was eons ago and I do not own a piano now. (The pitch pipe has to suffice.) Yes, I sang in my high school choir (shout out to Iowa Mennonite School) but it was a small school and lots of us did (read: were strongly encouraged by our parents to do so). And yes, I enjoy singing in church, but I don’t consider myself to be one to handily find the harmony and join right in. I prefer to stand near a strong alto and follow along. And yet, for these last nine years, I have had the privilege of helping choose music for our children’s Sunday school or Vacation Bible School curricula. Assemble a team of writers. Our children’s materials are written by contract writers from across Canada and the U.S. Right now we are working on music for 2015 VBS materials. (2014 materials are available for sale here.) Managing Editor Mary Ann Weber ably coordinates our VBS materials and assembles the writing teams. The 2015 team hails from Ohio Mennonite Conference, and they met together over a weekend in November to outline the sessions. They discussed how to tell the stories, what crafts and games might be included, and gave suggestions for music to go along with the theme. Review the first round of suggestions: Mary Ann culls together music suggestions from the writers, adds some more of her own, and invites a small team from within MennoMedia to review the music. This is when staff shut the door or find a quiet spot and sing or hum songs to themselves in order to learn them. Does a song work for kids? Is it “sing-a-long-able”? Does it work theologically with the VBS theme? In the phone meetings we often hear things like, “I don’t think this song is right, but it reminds me of another song that goes like this …” And then the person talking shares a song on the phone. (We use the phone or Skype because our staff is dispersed. For this morning’s VBS meeting we were participating in Virginia, Indiana, and Ohio.) “Oh yes, I’ve heard that one before” is often said by another person, who then joins in the song. Think about balance: It’s always important to think about balance in assembling a CD of songs. With VBS materials, congregations expect peppy songs. But it’s also good to have a song in a minor key or a slower song to provide some relief. It’s good to have songs that will appeal to the youngest children as well as the oldest. It’s good to have songs in languages other than English. It’s good to have songs that describe God in a variety of ways. It’s good to have old favorites and brand new songs as well. It’s good to make sure you don’t have the same song two years in a row. Trust me, it takes time to try and get the right balance. Hire a CD coordinator: We at MennoMedia determine the music, then we hire someone to produce the CD for us. Typically this is someone from one of our churches. We listen to rough cuts and give feedback or request changes. We might make suggestions for certain instruments or to have children sing a certain song, but mostly we allow the musicians to do their work—knowing we’ve done ours in singing to each other on the phone. What’s your ideal VBS song? What songs can you remember from VBS or Sunday school as a child? P.S. Click here for samples from our 2014 VBS CD. Plus, we’re having a VBS sale right now on Welcome! Give and Receive God’s Great Love, our 2014 VBS materials. Order now for 10% off the retail price! Resolutions and Reading: What Books Appear on Your Reading List? It’s the time of year when you look at life and see what needs to happen. Do you need to improve your lifestyle through weight loss, exercise, or healthy eating? Or you want to take a close look at your finances and create new goals for you and your family? Maybe you should focus on making a relationship better, or taking up a hobby, or adjusting your attitude about something . . . there are many things to consider! I rarely make New Year resolutions. I know my enthusiasm will wane quickly and then I’ll be frustrated about not keeping something that I promised myself. So it’s best to not even create a resolution to begin with, right? This year, however, is different. Perhaps because my resolution isn’t about changing my life, or because it embraces something I already do, I feel great excitement for a task I plan to continue through all of 2014. My resolution is simple, really—I will keep a list of all of the books I read this year. It’s a simple resolution because I read a lot and I’ve often wondered how many books I read in a year, but I’m never before been motivated to keep a list. This year will be different! It’s the fourth week of January and so far six titles appear on the list. Some are forgettable—murder/suspense books from the public library—but they provide moments of pure adventure and escapism as I try to figure out who committed the crime. Every now and then I read something of substance that makes me pause and think, and so those books appear on the list with an asterisk. Fortunately, my role with MennoMedia lends itself to my resolution. I thoroughly enjoy the varied books that MennoMedia publishes, and am especially looking forward to two that will soon be released, Bonnet Strings, by Saloma Miller Furlong, and Jacob’s Choice, by Ervin Stutzman. Bonnet Strings is Saloma’s story of leaving the Amish as a young adult. Her previous book, Why I Left the Amish, was not printed by MennoMedia but I ran into it at our local bookstore and was challenged by Saloma’s story and the decisions she had to make. 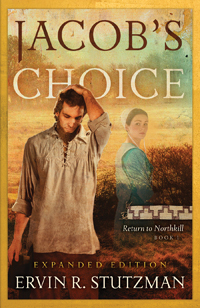 Jacob’s Choice is a story of the Hochstetler family in Pennsylvania who were attacked in 1757. Yet, Jacob refused to fight back. Several family members are killed, while others are captured by the Lenape. No doubt, both books will receive an asterisk on the list. Do you have any good book suggestions for me to add to my list? What types of New Year’s resolutions do you keep? Feb. 3 and Feb. 8, respectively. DVDS and CDs you might enjoy this year.